Ford Sabre 300hp 1000 hours since rebuild. ZF 1.5 reduction box. Furuno GPS and plotter, Koden radar, JRC colour sounder, ICOM DSC VHF, Portable VHF, Navico Corus (temperamental) Auto Pilot, Safeshore Galvanic Isolator, Sterling Battery power management. Only four owners from new, I have owned her for last five years and reluctantly selling due to returning to commercial fishing. The price includes all safety equipment for MCA coding apart from liferafts which are hired. The hull and cabin are original gel coat not painted, and the hull below waterline epoxied. The prop was refurbished by Clements Engineering this year giving a cruise speed of 14/15 knots @ 2000 rpm and 20 knots @ 2400 rpm. The cabin has a two burner hob/grill/oven, sink with H+C water, fridge, and dehumidifier. There are two single berths in the forward cabin an electric flush toilet and ample storage space. 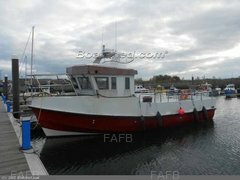 Would consider exchange for 8-10 commercial boat with uncapped shellfish licence cash either way. The boat has been mainly used privately with the occasional light charter including appearing in ITV's Vera as a police launch.